At 3:00 pm on 4 September 2015 five hostile U.S. Immigration and Customs Enforcement (ICE) agents picked up Rwandan asylum seeker Dr. Leopold Munyakazi in a surprise Gestapo-like raid on his home in Baltimore MD. A man that international human rights experts believe to be the victim of a smear campaign by the criminal military regime in Rwanda, Dr. Munyakazi has over the course of his struggle for freedom (since 2009) 100% complied with all immigration reporting and monitoring requirements. After years of appeals leading to a 2736 page document on his case, on 5 June 2015 U.S. Immigration Appeals Judge Elizabeth Kessler dismissed the likelihood of torture upon return to Rwanda and subsequently denied asylum. Why was he picked up with such hostility and removed for deportation at the beginning of a long holiday weekend? Dr. Leopold Munyakazi at his home in 2009. AP. At 3:00 pm on 4 September 2015 five hostile U.S. Immigration and Customs Enforcement (ICE) agents stormed the Baltimore MD home of Rwandan asylum seeker Dr. Leopold Munyakazi in a surprise Gestapo-like raid. A man that international human rights experts believe to be the victim of a smear campaign by the criminal military regime in Rwanda, Dr. Munyakazi has 100% complied with all immigration reporting and monitoring requirements over the course of his six year struggle to regain his freedom. On 5 June 2015, after six years of appeals, U.S. Immigration Judge Elizabeth Kessler dismissed the likelihood of torture upon return to Rwanda and denied asylum. Why was this man who was originally welcomed to the U.S. through the "scholars-at-risk" program, who provided exemplary teaching at a renowned U.S. college, and who followed all U.S. laws and immigration protocols -- and showed zero risk of flight after his persecution by Rwanda began -- treated with such hostility and taken into custody for deportation at the beginning of a long holiday weekend? "The problem is that ICE picked him up on a Friday afternoon before Labor Day weekend." Immigration attorney Ofelia Calderon has dedicated the past six years of her life to Dr. Munyakazi's defense, pro bono, because she believes him to be an innocent man who faces certain death upon removal to Rwanda. "So tonight I filed a motion for an Emergency Stay that referred to a document that is 2736 pages, but no one is looking at that, and no one is going to look at that before Tuesday. They can put him on a plane and send him back to Rwanda at any moment." 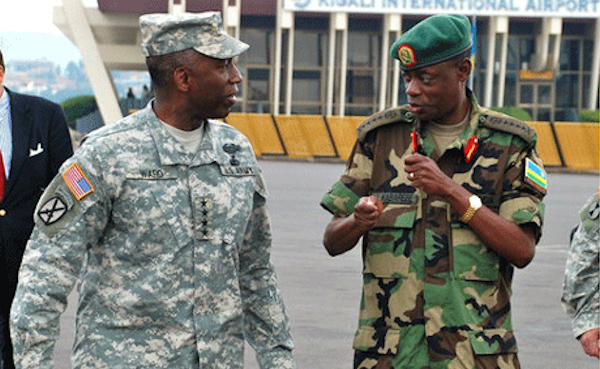 The United States, Britain, Canada, Germany and Israel have been the primary backers of the Rwandan regime, which along with the regime in Uganda offers strategic bases for the Pentagon's AFRICOM (Africa Command) and SOCOM (Special Operations Command) deployments in the Great Lakes region countries, in East Africa and Sudan. Wanted by the regime of President Paul Kagame on fabricated "genocide" charges since 2009, Dr. Munyakazi has never deviated from mandated controls on his whereabouts (wearing an ankle GPS tracking device for the past five years) and was amicably compliant with every detail of his immigrations and asylum protocols. 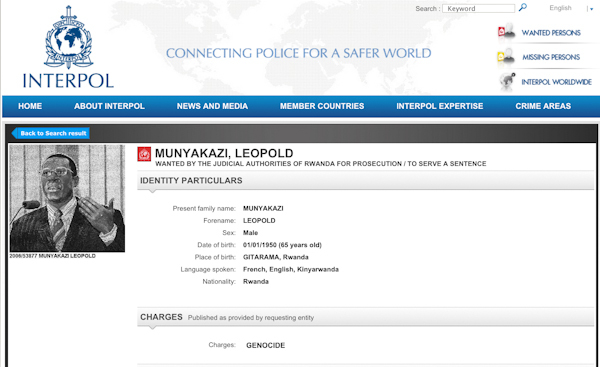 Dr. Leopold Munyakazi is listed as a WANTED criminal on the INTERPOL web site. Meanwhile, INTERPOL does not list as WANTED the 40 high-ranking Rwandan military officials indicted by Spanish Judge Andreu Merelles on 6 February 2008 for genocide, war crimes, crimes against humanity and terrorism under the doctrine of Universal Jurisdiction. Dr. Munyakazi's home in a Baltimore suburb was today (4 September 2015) stormed by some five uniformed ICE agents who arrived in two unmarked SUVs. Dr. Munyakazi, who had been lounging on his sofa in underclothes watching TV, was handcuffed for removal without any opportunity to dress properly or recover his medications to take with him. Only after pleading with the sole female ICE agent was a distraught Catherine Munyakazi allowed to partially dress her husband in a shirt and shoes. Tonight Dr. Munyakazi was shipped off to Maryland's Howard County Immigration Center for immediate deportation back to Rwanda for what many Rwanda observers claim will be certain death at the hands of the regime. On 2 July 2015, Dr. Munyakazi's lawyer Ofelia Calderon filed an appeal in the U.S. Court of Appeals, Fourth Circuit and the deadline for her opening brief was scheduled for early September. Why was ICE so cagey in picking up Dr. Munyakazi at 3:00 pm on a Friday afternoon of a long holiday weekend, knowing full well that any legal petition for a stay of deportation won't even be seen until offices open on Tuesday morning? Dr. Leopold Munyakazi was a professor employed at Goucher College in Maryland until 2008, when he was arrested by ICE agents after making a public speech decrying the abuses of the Kagame regime, the falsification of genocide charges and the lies of the official Rwandan Patriotic Front (RPF) genocide narrative. On 18 February 2009 I published an Open Letter to Goucher College on the Suspension of Munyakazi. On 23 May 2010, U.S. attorney and ICTR defense counsel Peter Erlinder was arrested and illegally detained in Rwanda. Mr. Erlinder flew to Rwanda to represent his client Victoire Ingabire, a Hutu woman also persecuted by the Kagame regime. Professor Erlinder, charged with 'genocide denial' and denied bail twice, was released on medical grounds after 21 days incarceration but then faced charges with punishment up to 25 years; he returned to the United States in June 2010. Victoire Ingabire arrived in Rwanda in January 2010 to contest the upcoming presidential elections. She and her aides were immediately arrested and she was charged with genocide denial and other thought crimes. Rwanda's most notable dissident at present, Ms. Ingabire remains in prison in Rwanda and her story is mostly unknown by the world. The military and intelligence apparatus directly run by President Paul Kagame maintains elite networks of death squads inside and outside Rwanda. Tasked with hunting and neutralizing any dissidents, critics, intellectuals, writers, human rights activists, or other 'opposition' to the regime of Paul Kagame, these agents operate freely throughout Africa, Europe, Canada and the United States. Anyone critical of the Kagame military regime is falsely accused of involvement in genocide, 'genocide negationism' or 'genocide denial'. The official narrative on 'genocide' -- distilled to a simple sound-bite about Hutus killing Tutsis in 100 days of genocide -- is maintained by the current government of Rwanda and its military, political and economic partners to silence debate and manufacture a version of events that protects the perpetrators and criminalizes victims like Dr. Leopold Munyakazi, Beatrice Munyenyezi, and many others. President Paul Kagame runs the military dictatorship in Rwanda with his closest military associates from the former Rwandan Patriotic Front/Army (RPF), now known as the Rwanda Defense Forces. In October 1990, the RPF guerrilla army invaded northern Rwanda from neighboring Uganda, backed by the United States, Canada, Britain and Israel. Over the next four years the RPF terrorized Rwandan civilians as they slowly seized the country and overthrew the Hutu-majority government of President Juvenal Habyarimana in a coup d'etat. The U.S. sponsored Rwanda genocide involved covert U.S. and Israeli operatives who been coordinated the funding, weapons, political support, and propaganda (psychological operations) for decades of covert guerrilla warfare in Burundi, Congo, Rwanda, Sudan and Uganda. The presidents of Rwanda and Burundi and their top military advisers were assassinated on 6 April 1994, allegedly with the U.S. Central Intelligence Agency's backing. The double presidential assassination set in motion events that would lead to the death of some 800,000 to 1.5 million innocent Rwandan Hutu, Tutsi and Twa people, the subsequent invasion of the Congo, and the deaths of millions of Congolese and Rwandan (mostly Hutu) people there. Predominantly comprised of hardened Uganda guerrillas of the Tutsi ethnicity who fought (1980-1985) to bring Uganda's strongman Yoweri Museveni to power, these guerrillas, backed by the Britain, Canada, Germany, Israel and the US, have perpetrated massive genocide, war crimes and crimes against humanity on millions of innocent civilians in Uganda, Rwanda and the Dem. Rep. of Congo. Contrary to popular propaganda, the sound bite claiming that the RPF 'stopped the genocide against Tutsis' in Rwanda is a gross mischaracterization of the nature of genocide versus civil war in Rwanda. It is also a sound bite that deflects attention from the RPF role in mass atrocities in Rwanda and Congo. The Kagame regime is able to get away with anything it wants -- arrest and torture opponents, persecute refugees everywhere, plunder minerals from Congo and perpetrate genocide there -- because President Paul Kagame has provided the Pentagon its biggest, centralized base for U.S. covert and overt operatios. 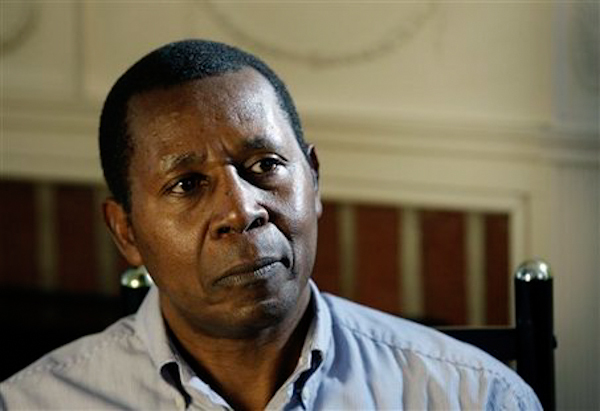 Dr. Munyakazi was framed by the Kagame regime and publicly branded as a genocidaire by a short-lived NBC News television program that sought prime-time ratings by tracking down and 'exposing' supposed genocidaires. The program was titled The Wanted, and the morality of 'good versus evil' was underscored by the choice of the show's commentator, Scott Tyler, an ex-Navy Seal, while the wanted man, Dr. Leopold Munyakazi, was their embodiment of evil. The zealous NBC News team acted as accuser, judge and jury against Dr. Munyakazi. U.S. prosecutors in Rwanda asylum cases are generally very ignorant of the politics of genocide, war crimes, and crimes against humanity in Rwanda, or they have been irreconcilably swayed by the propaganda of the Kagame regime and its partners, which is everywhere in the western media. Also, Rwandan agents continue to operate within the U.S. borders, influencing, bribing and co-opting U.S. government officials. In two related U.S. court cases against innocent Rwandans, two U.S. prosecutors traveled to Rwanda and later testified in court to that it was very easy to get the information they wanted, they did not need a clearance from the Rwanda government, and that they went to the countryside and met witnesses without government assistance or monitoring. They even went to prisons to talk to prisoners without Rwanda government help, they claimed, and reported to the court that conditions of prisoners were excellent. While U.S. government prosecutors who have worked in Rwanda under these supposed 'independent' conditions have not been deposed under oath, their claims are impossible under the current military regime in Rwanda. Dr. Munyakazi's investigation was conducted by ICE special agent Jason Hyman, the U.S. government's star witness, "a boy doing a man's job" who spent three weeks in Rwanda on his first ever human rights investigation. In the case of Dr. Munyakazi, he was required to show a preponderance of evidence proving his innocence, the exact opposite of the U.S. judicial standard of guilty beyond a reasonable doubt. The court decided he was guilty of genocide based on the spurious investigation and testimony of an unqualified and inexperienced agent seeking to make a name for himself. Usually the RPF regime provides 'handlers' that manage investigations and spoon-fed investigators with information fabricated or cleared by the regime. Rwanda experts for the defense at asylum hearings, including ICTR lawyer Peter Erlinder and Filip Reyntjens, a Belgian Rwanda expert, have testified (as experts for the defense) to the problems of asylum cases and the interference by the Kagame regime in court cases in Rwanda, at the ICTR and abroad. Dr. Munyakazi's defense experts at his original trial in 2009 included Peter Erlinder, former U.S. Attorney General Ramsey Clark, and myself. "The RPF brooks no opposition to its policies, and is allergic to criticism of any sort." Rwanda scholar Dr. Susan Thomson of Colgate University is an expert whose field research in Rwanda brought the wrath of Kagame down upon her. "It also does not tolerate any form of political dissent; instead, it works to maintain total control over the political and social landscape. The RPF beats up or imprisons political moderates, as well as prominent members of civil society who speak out against the post-genocide policies are perceived to have criticized the government. Individuals who can flee into exile will do so; if they are prominent members of Rwandan society, the RPF will ostracize the individual in question, labeling them as enemies of the state. Some, particularly senior politicians and journalists who have fallen afoul of government policy, are tracked down in their places of exile and assassinated, presumably by agents of the RPF. Others like Dr. Munyakazi, are subject to the long-arm of political harassment that seeks to return potential asylum seekers home to Rwanda." "It is my professional opinion," wrote Dr. Thomson in Expert's Report of Dr. Susan M. Thomson in the Matter of Leopold Munyakazi (never allowed into evidence), "that Dr. Leopold Munyakazi is the target of a RPF-led smear campaign of his character which has in turn affected his ability to enjoy a fair immigration process." "Why would they take him on a Friday afternoon," his attorney Ofelia Calderon stated late Friday evening on 4 September, "before a Labor Day weekend, knowing how hard it will be for me to respond, and that I don't have any options to prevent his removal? They can send him back to Rwanda at any moment." This is not a deportation, it is U.S. government collusion in the certain death upon removal to Rwanda of an innocent Rwandan Hutu intellectual who has long been included on the Rwandan hit list of enemies of the U.S.-backed regime in Kigali. Photography Credits: keith harmon snow (unless otherwise noted). Dr.Munyakazi is innocent, all allegations against him are fabricated by Kagame's military intelligence agents, it is just he was bought by Kagame's killing machines and intelligence agents in US.This is not a deportation is an execution of DR.Munyakazi committed by ICE.Dr Munyakazi is on Kagame's hit list as an intellectual Hutu and a dissident to Kagame dictatorship regime.How long this bloodsucker Kagame is going to lie and manipulate US institutions?I am crying for Justice! Yes, you are quite right. I knew that my interpretation was flawed, and it was puzzling me what I needed to do to correct the story, and so I now have. change.org is an american internet FRAUD!be aware this is just another SCAM!to make you feel free they do not COUNT RIGHT NUMBER OF PEOPLE who signed up!We notice that in many initiatives our family have participated precisely because these initiatives have been growing in popularity and are supposed to be a key player.